As a consequence of the pandemic of type 2 diabetes, an outbreak of several diabetic complications, particularly diabetic retinopathy is foreseen by several healthcare institutions and pharmaceutical companies across the globe. Among complications of diabetic retinopathy, proliferative diabetic retinopathy has witnessed a relatively more significant surge worldwide. For example, roughly 1.5% adults suffering from diabetes were affected from proliferative diabetic retinopathy in the U.S. in the recent past. Although molecular and cellular bases of the proliferative diabetic retinopathy have only been partially understood, complication of diabetes is evidently characterized by formation of new vessels inside retina that depicts abnormal architecture and permeability. Angiogenesis is considered to have a major role in pathogenesis of proliferative diabetic retinopathy, with intravitreal antiangiogenic injection being suggested by researchers and drug developers as a viable treatment for the disease. Different antiangiogenic approaches are being employed for developing effective treatment of proliferative diabetic retinopathy, which in turn are likely to have imperative roles for therapy & prevention of the disease in the upcoming years. A recently composed research report of Transparency Market Research has envisaged the global market for proliferative diabetic retinopathy to register a high single-digit CAGR through the forecast period (2017-2026). Revenues from treatment of proliferative diabetic retinopathy around the world are poised to reach roughly US$ 1,000 Mn by 2026-end. According to the National Center for Biotechnology Information (NCBI), over 150 Mn individuals were affected by diabetic retinopathy globally, with majority of them at the risk of developing proliferative diabetic retinopathy. Such rapid rise in the number of people with this diseases will increase the scope of its treatment & prevention. Across countries with relatively less availability of treatment facilities, demand and supply of effective treatment drugs have been witnessing a tremendous surge. Recent studies suggest high level of the vascular endothelial growth factor (VEGF) being detected in fibrovascular tissues of eyes of diabetic patients has prompted use of anti-VEGF as the most effective and efficient management method, in cases of proliferative diabetic retinopathy. Introduction and robust adoption of the intravitreal pharmacologic agents, especially drugs that inhibit actions of VEGF, have directed the focus of approach toward proliferative diabetic retinopathy treatment from vision stabilization to improvement. Improvements in visual acuity of patients with this diseases by using anti-VEGF are comparatively more effective than improvements observed in treatment by using corticosteroids. Geriatric populace across the globe has been exhibiting a significant increase, and this demographic group is highly susceptible to various chronic disorders such as diabetes. Proliferative diabetic retinopathy development is therefore more prevalent among the elder individuals. Cases of this diseases are deemed to be multifold in patients who are above 65 years old and have a diabetic history. This has further driven the demand for effective drugs for management of proliferative diabetic retinopathy in older population. The rise in disposable income of consumers, coupled with concerns regarding vision loss has rubbed off on spending by patients for availing necessary treatment of diabetic retinopathy. Availability of advanced technology & minimally invasive laser technique that complements faster recovery time is likely to encourage willingness of patients affected from proliferative diabetic retinopathy in adopting surgical treatments. Key companies significantly contributing to growth of the global proliferative diabetic retinopathy market include Intas Pharmaceuticals Limited, Santen Pharmaceutical Co., Ltd., Valeant Pharmaceuticals International, Inc., Allergan Plc, Regeneron Pharmaceuticals, Inc., Merck KGaA, Cipla, Ltd., Genentech, Inc. (Roche Holdings), Novartis AG, and Pfizer, Inc.
Proliferative diabetic retinopathy prevails as leading cause of blindness across industrialized countries worldwide. Although remarkable advancements have been made in the diagnosis and treatment of the disease, several imperative management questions as well as treatment deficiencies continue to persist unanswered. The diabetic pandemic has threatened overwhelming resources and increasing incidences of blindness, which in turn has necessitated the development of actionable programs for diagnosis and treatment of the disease as well as the diseases caused as a consequence of diabetes such as proliferative diabetic retinopathy. The global proliferative diabetic retinopathy market has been thoroughly analyzed in the latest research report developed by Transparency Market Research, which issues in-depth insights on prominent factors impacting growth of the market. Growth prospects offered in the report are assessed for the period between 2017 and 2026, and the historical analysis on the market has been delivered for the period between 2012 and 2016. The report issues analysis on key threats, opportunities, restrains and drivers of the proliferative diabetic retinopathy market’s growth, coupled with in-depth study on their likely influences on the market. Valuable qualitative information offered in the report can enable readers in acquiring a thorough understanding of impactful market dynamics. Apart from a comprehensive analysis on influential market dynamics, the report also encompasses the raw material sourcing strategies, pricing analysis, cost structure, and supply chain analysis on the global proliferative diabetic retinopathy market. The report comprises a detailed segmentation-wise analysis on the global proliferative diabetic retinopathy market, which provides readers with better understanding about lucrative and sluggish avenues for the market expansion. The global market for proliferative diabetic retinopathy has been assessed across a range of segments viz. drug class, mode of administration, distribution channel, and region. Geographically, the market has been branched into Asia-Pacific excluding Japan, Latin America, Japan, Middle East & Africa, Europe, and North America. 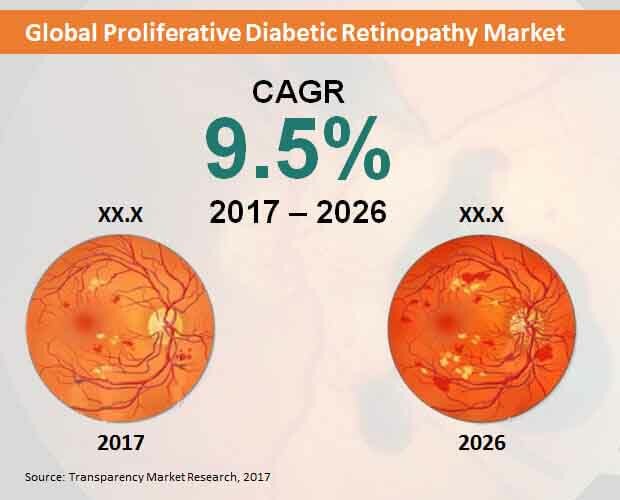 TMR’s report on the global proliferative diabetic retinopathy market is expected to be beneficial for proliferative diabetic retinopathy drug manufacturers, as existing players can leverage the intelligence offered for making better business decisions. Players evaluating a market entry will gain necessary insights through this report. This report is expected to serve as pragmatic and comprehensive source of knowledge and insights, which will help key stakeholders to formulate their future business plans. The report also encompasses an exhaustive chapter on the proliferative diabetic retinopathy market’s competition landscape, which gives a detailed profiling of key companies that offer significant contribution to the market growth. Along with in-depth discussion and analysis on the business and product development strategies of the market players comprised, the report also sheds light on financial performance of these companies, coupled with their recent developments over the past couple of years. This concluding chapter of the report is of high value to the report readers, as they can attain actionable insights on novel developmental and growth strategies employed by the market players. This will further help them in gauging their respective positioning in this highly competitive market.